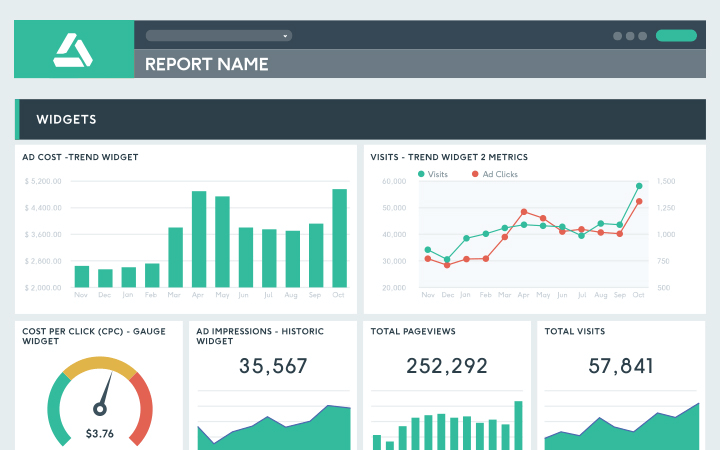 Streamline your social media reporting process and impress your clients with custom reports in which they can see everything about their campaigns at a glance. Our Facebook Ads reporting tool enables you to quickly assemble all your important KPIs, customize your layout, incorporate notes and comments, and then deliver your reports automatically to your clients’ inboxes. You’ve got a lot of clients, and no time to spare. It’s important to deliver the KPIs they need - Impressions, Social Reach, ROI, Engagement, Likes, and more - in a visually attractive way, but you don’t want to start from scratch every month. With our Facebook Ads report preset templates, it’s already set up for you! With standard Facebook Ads reporting tools, you’ll often end up with a less-than-pretty result. Or if you want something more aesthetically pleasing, you’re usually going to have to work hard to create it yourself from scratch. With DashThis, you have the simplicity of an automated tool, and the beauty of something entirely custom! No matter what type of Facebook Ad campaign you’re running, DashThis has the KPIs you need to keep track of. If you’re tracking the basics like Clicks, Reach, or Spend, we’ve got preset widgets to save you time. If you want to choose your own metrics and dimensions, that’s where our custom widgets come in! Even though you’re looking for a Facebook Ad reporting tool, it’d be nice if you could include data from other platforms too, right? We’ve got you covered! DashThis connects to 30+ integrations. No programming, no third party systems, no complications. Plus, you can create a single report showing multiple integrations’ data together, so there’s no need to create tons of reports for the same client. Simple, right?! We won’t lie: there are quite a few Facebook Ads reporting tools on the market at this point. So what makes us different? We’re mainly known for two things: being one of the simplest tools to use, and having hands-down the best customer service in the industry. Don’t believe us? Check out what they’ve got to say! Social media reporting doesn’t need to be complicated. In fact, it shouldn’t be. That’s why our Facebook Ads reporting tool is both powerful and simple. Utilize preset templates, create your own custom reports and widgets, add multiple users to your account, schedule automatic email dispatches to deliver your reports right to your clients’ inboxes… it’s all here! We don’t like playing favourites with our users. That’s why no matter which plan you choose, the only difference is the number of Facebook Ads reports you actually use. Everything else - and we do mean everything - is included, no matter what. Yep, even your very own personal account manager, available whenever you have a question, comment, or just need to chat! Save on a custom URL and design with a white label bundle that includes both! A Facebook Ads report just the way you want! Our blog is full of Facebook Ads reporting content! Want to get the most out of our Facebook Ad reporting tool? That’s what our blog is for! And if you want to get content right in your inbox, sign up for our newsletter. We won’t spam you, we promise!